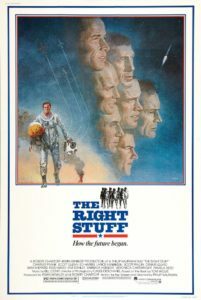 041 – The Right Stuff | All Eighties Movies. All The Time! With the sad passing of the brilliant writer and actor Sam Shepard we take a look at one of his most famous roles – that of Chuck Yeager. The man who broke the sound barrier and was truly made of The Right Stuff. This pivotal role shadows over the incredible achievements of the Mercury Astronauts in a classic from the 1980’s! Find the Childhood Remastered Podcast HERE! This entry was posted in Podcasts and tagged action, drama, history. Bookmark the permalink. Bloody awesome pod cast! Gidget would love to know more about your late father! One of my favourite 80’s movies and for a 3 hour movie PLUS trivia you both did an amazing job. Will listen to more of your pod casts now. Saw Gidgets tweet about it and was stoked. I could not find those brilliant gifs on google? Where did you get them? Cheers. Thanks so much Paul!!! So kind. I have a video of my late father talking about his time in WW2. Once I find it I will link it to you! Again thanks for listening. Outstanding pod cast. I listened with my grandfather. It was his first time listening to a pod cast and asked me to ask you to pod cast more war/military movies. His name is Bob Fennelly. He turns 97 in December.